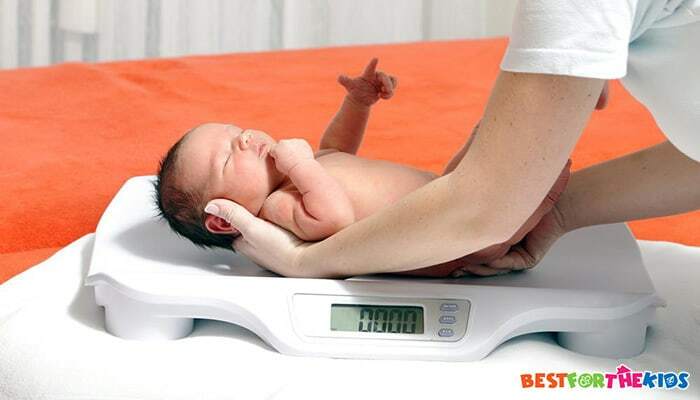 When your baby is born, they’ll be weighed, and a continuous record of your baby’s weight will begin. You may record this in your own document or the baby book that the doctor provides you with, either way; there will be a running record. Checking your baby’s weight is vital to monitor how quickly they are growing as well as gaining essential information on your baby’s overall health. However, to ensure the health of your baby, you may not want to wait until each doctor visit. In fact, it’s recommended that you don’t. 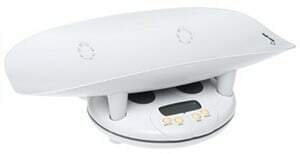 By investing in the right set of baby scales, you can accurately measure the weight of your baby whenever you want, giving you the unique ability to address any problems, such as an overweight or underweight baby, enabling you to sort them out before any problem becomes a more serious condition. To give you a helping hand, I’ve compiled a list of some of my favorite baby scales that are currently available. Using these scales, you’ll be able to accurately weigh your baby, giving you a heads-up that everything is on track. To start my list, I’ve chosen this lightweight, affordable and incredibly easy to use scale that gives you everything you need to monitor your baby’s weight accurately. This mid-range scale has the capacity to hold up to 44 pounds, displaying the total weight down to an accurate and precise 0.5-ounce increment, giving you all the information you need to ensure that your baby is as healthy as possible. This figure is displayed on the large LED screen, enabling you to have a clear indication of your baby's weight, and it prides itself on its auto-shutoff feature that helps to protect your scale from damage if the weight limit is exceeded. The scales themselves are light, durable and highly functional, giving you the ability to take them wherever you go, allowing you to use them whenever you need to. What's Great About It: In addition to all of these essential features, these scales also provide you with a unique Hold function. This means that your scales will detect and display an accurate reading of your baby’s weight, even if your child is feeling restless and won’t stop moving around the scales. 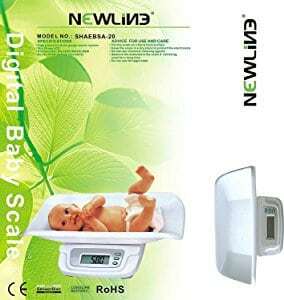 If you’re looking for a unique and high-quality set of baby scales that provide you with all the features you’ll need to record your baby’s weight accurately, the Newline Digital Scales could be ideal for you. This large yet lightweight set of scales boasts an incredibly helpful large plastic tray, ideal for supporting your baby while weighing them. The scales are capable of recording your baby’s weight up to an outstanding 46 pounds, and can easily switch between pounds and kilograms. The scales feature an essential ‘tare’ function, enabling you to easily set up your scales for the most accurate weight recording sessions. With your child’s well-being in mind, the plastic tray is produced using safe and tested plastics that are both CE and RoHS certified, ensuring your baby’s skin has no risk of absorbing potentially harmful plastic chemicals or substances. What's Great About It: Integrated into your device, you’ll be able to enjoy the added benefits of an advanced memory mode that keeps tracks of your baby’s weight. This means that if you forget to write it down, you can simply backtrack through the software to find your missing measurement. 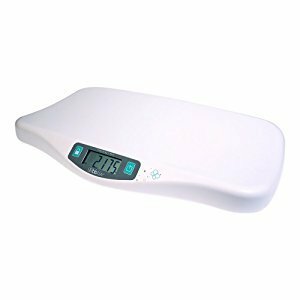 If you are looking for a high-end yet affordable baby scale set that’s packed with features that you’ll never know what you did without, the bbluv Digital Scales could be the perfect choice for you. These highly accurate scales let you track and monitor your baby’s weight with immense detail, providing you with a measurement up to three decimal points. These scales pride themselves on their comfortable and supportive cradle, ensuring your baby is happy during every weighing session. 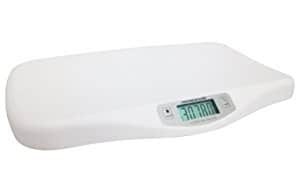 Integrated into these scales, you’ll be able to enjoy the endless benefits of a fully-functional tare mode, enabling you to add an extra layer of comfort, such as a blanket, while still receiving an accurate measurement. There’s also a built-in power saving mode to preserve battery life, and a hold function that saves the weight of your baby, even if they’re feeling restless and won’t stop moving around. What's Great About It: Thanks to the large built-in LCD screen, you’ll be able to easily monitor and record your baby’s weight in no time at all due to the large figures displayed. There’s also a handy battery life indicator as well as an overloading weight limit to ensure you don’t break your scales. Capable of weighing babies up to 44 pounds, the Beurer Baby Scales provide you with all the features you need to accurately monitor and record your baby’s weight as they grow throughout this crucial development stage. These scales pride themselves on their extremely comfortable and ergonomic tray that supports your baby during every weighing session. The scales also provide you with a large, easy to read digital display, making it easy for you to read the measurements, unlike a traditional set of scales with a moving indicator. As you would expect from a professional set of scales, these also have a built-in tare and hold function to ensure the measurements are accurate, enabling you to successfully keep track of your baby’s weight. The scales are designed to be inviting and vibrant, allowing you to set them up in any room of your home comfortably. What's Great About It: There's a ton of built-in features when it comes to this outstanding set of scales. There’s an automatic switch-off function to preserve your devices battery life as well as easy-switch settings to change between pounds and kilograms, allowing you to easily measure in whatever increments you prefer. You may have heard of the Salter brand when it comes to kitchen scales, but they are also the market-leaders in baby scales. With this set, you’ll be able to accurately record your baby’s weight as they grow, all the way up to an incredible 45 pounds. Each measurement is highly accurate to one decimal place and can be easily converted into a set of toddler scales by simply removing the comfortable and supportive plastic tray, so you can track your child’s health, even after they’re a baby. 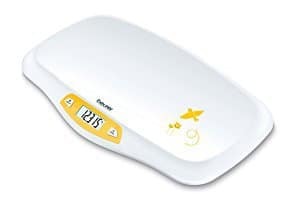 As you would expect from this premium yet affordable set of scales, there’s an integrated hold function that helps you to accurately record your baby’s weight on the scales, even if they’re moving around. There’s even a zeroing tare function, meaning you can either add extra layers of comfort, such as a blanket or to subtract the weight of your baby’s diaper, once again ensuring a precise measurement. What's Great About It: As you would expect from a Taylor Salter product, the quality of this device is unparalleled. The device is made from high-quality, child-friendly plastic materials, making this one of the most durable and lightweight devices on the market. To conclude my list of favorites, I’ve opted for the 2-in-1 Baby Scales from Health-o-Meter. With this purchase, you’ll be able to enjoy all the benefits and advantages of a high-end set of scales for an affordable price. To ensure you’re feeding your baby the right amount of food between doctors’ visits, you’ll be able to measure your baby’s weight to a pinpointed one decimal place, perfect for ensuring your baby’s health. What’s more, simply remove the tray, and you’ll even be able to measure the weight of your toddler as they grow, all thanks to the scale’s capabilities of being able to hold an incredible 60 pounds maximum weight. There’s a large digital screen that allows you to easily read and record your child’s weight and even a special infant lock on the tray, adding extra layers of stability to your scales, even if your child is continuously moving around. What's Great About It: Unlike the majority of scales on the market, you’ll be able to enjoy the included Healthy Growth Baby book. In this book, you’ll be able to track and record your baby’s weight and growth, and can compare your statistics to the national averages. There’s also a special section for recording their tooth growth and shoe size, enabling you to keep and store memories for you and your child later in life. With the knowledge of some of the most fully-featured scales on the market, it’s time to choose the ideal set of scales for you. Scroll down to discover my step-by-step buying guide, detailing everything you need to know so you can make the most educated decision possible. To start off, you’ll want to a set of scales that will last as your child grows. If you choose a set of scales that can only handle 10 pounds, your baby will quickly outgrow it and you’ll have to buy another set. As you can see from my list, most scales are set to handle children up to an average of 45 pounds. Some of the more premium scales may even exceed this figure to around 60 pounds. One thing you should consider is if you want to weigh your child as they grow from a baby into a toddler. If you do, then always invest in a high-capacity set of scales. As you are recording your child’s weight for their health, you’ll want a set of scales that are extremely accurate. After all, there’s a big difference between 0.1lbs and 0.9lbs, especially as a baby. For an accurate reading, see what number of decimal places your chosen set of scales provides you with. The more decimal points, the more accurate your measurement will be. The chances are that as you weigh your baby, they’ll be fidgeting around and they’ll probably want to get out. However, you still need to take a reading. To make life easy for yourself, look for a set of scales that have a large digital display with large numbers. This will mean you can easily look over at the scales display for the measurement before tending to your child’s needs, minimizing the room for misinterpretation. Thanks to the advancements in modern-day technology, there is a comprehensive set of features that will come with your baby scales that will provide you with the most painless and stress-free experience as possible. Features like the tare option enable you to zero your display, no matter what is in the supportive tray. This means you can add blankets to your scales to ensure that your baby is comfortable, or even weigh a diaper so you can receive a more accurate reading of your baby’s weight. Another key feature to look out for includes a hold function. 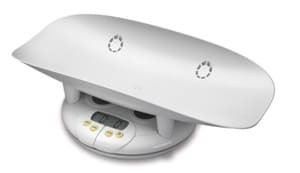 This stabilizing feature means the scales can easily and accurately record the weight of your baby, even if they are moving around while using the scales. As a rule of thumb, the more money you spend on a set of scales, the more beneficial features it will provide you with. As we all know, monitoring, tracking and recording your baby’s weight is vital to ensuring your baby grows up healthy, strong and happy. By taking your time to invest in the right set of scales, you can be sure that your child is getting everything they need while growing up in the healthiest way possible.